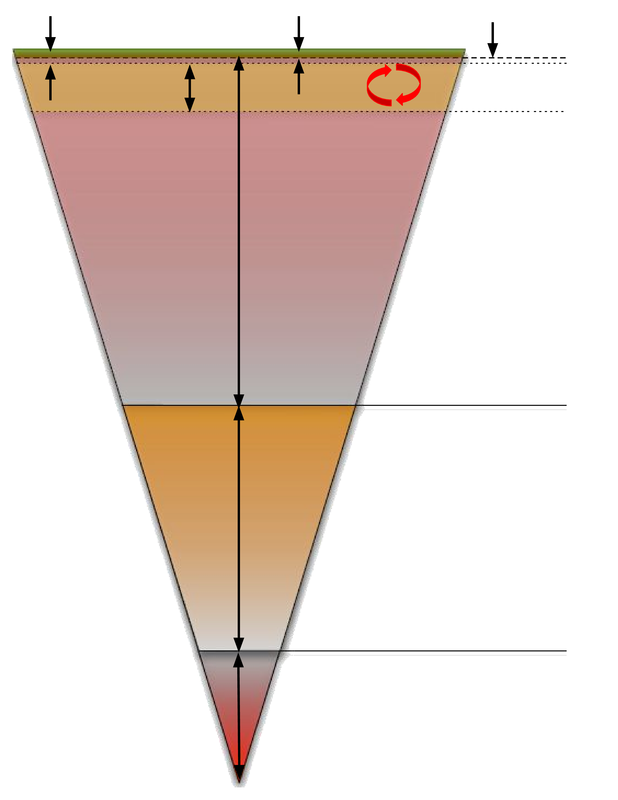 The green area between these two arrows is what layer of the Earth? There are two types of this layer, what are they called? The crust under the continents is called continental crust. What is it made of? The crust under the oceans is called oceanic crust. What kind of rock is it made of? Which kind of crust is thicker - continental crust or oceanic crust? This dotted line is the boundary between the crust and the mantle. What is it called? How deep in the Earth is it? The green and pink areas between these two arrows is a layer of the Earth that is actually made of parts of two other layers. What is it called? The lithosphere floats on this layer. What is it called? How thick is the asthenosphere? What do these two curved arrows represent? This big long arrow shows the thickest layer of the Earth. What is the name of this layer? How thick is the mantle? Which layer of the Earth is this? What is the outer core made of? The outer core is spinning. Why is that important for life on Earth? What are the temperatures in the inner core? The inner core is hot enough to melt but it can't. Explain why the inner core cannot melt. Extra Credit! - This is the boundary between the mantle and the outer core. What is it called?